You’ve probably heard the term multi-cloud environment tossed around a lot lately, but do you really understand what it is? Simply put, a multi-cloud environment is formed from two or more cloud computing services. Since no one provider offers a single solution that will fully address a customer's every requirement, typically more than one cloud service is leveraged to increase redundancy and/or maximize processing power. In doing so, the customer reduces its dependence on a single vendor, enabling increased flexibility throughout an enterprise environment. It’s important to realize that although you may see the terms multi-cloud and hybrid-cloud used interchangeably, there is a distinct difference between the two. Unlike a multi-cloud environment, where different clouds are used for different tasks, the components of a hybrid cloud typically work together. As a result, data and processes tend to intermingle and intersect in a hybrid environment, while in a multi-cloud situation, usage typically remains in its “own” cloud’s silo. 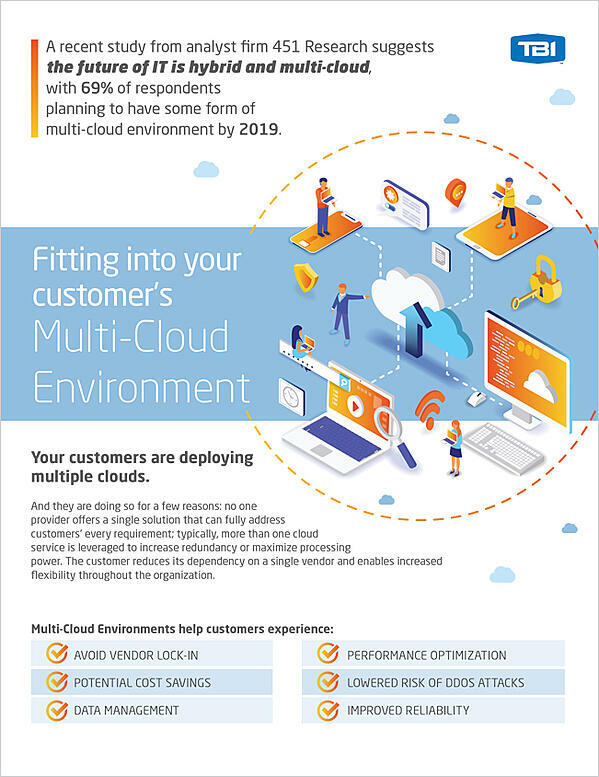 This download, Fitting into you customers Multi-Cloud Environment, helps partners to understand when a customer should deploy a multi-cloud solution, the benefits of doing so, and how to help them create and execute a strategy to successful implementation.